There are various administration functions available in Accounting. Any changes that you make will not only apply to the company that you are logged into, but will apply to all of the companies that you create. In Accounting, there are three types of users: owners, regular users and accountants. If you have created a company, you are the owner of the company. If you have received an invitation to a company, you are a regular user. If you are an accountant and have received an invitation to the company, then you are the company accountant. 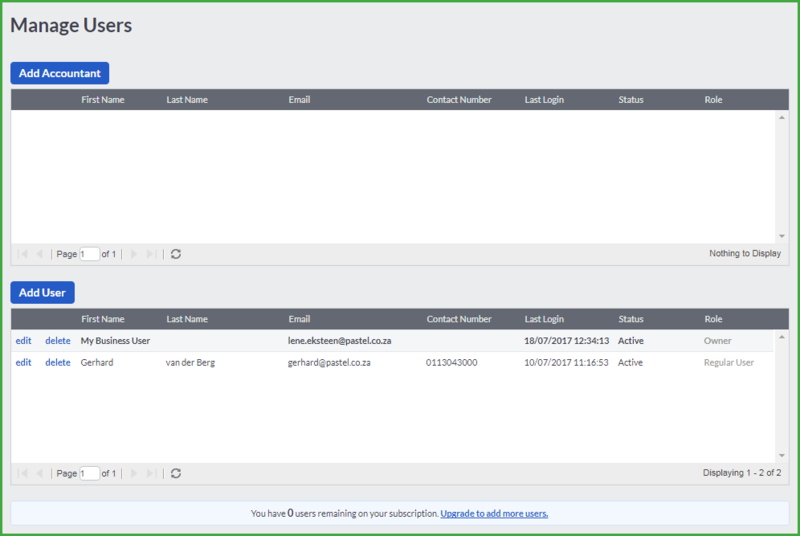 The Manage Users screen displays the users that you have added in to the company. You add users to your company in this screen. You may need to upgrade your license in order to add additional users. When a user is added in the Manage Users screen, they will only have access to the company that you were in when you added them. You are able to sort your users by clicking on each of the column headings. You can select to sort the rows in ascending or descending order. To add a regular user, you will click on the Add User button and to add an accountant, you will click on the Add Accountant button. Any users that you create in one company will be available to be added to your other companies. Users are added to other companies in the Control User Access screen. You are able to limit user access to different companies. 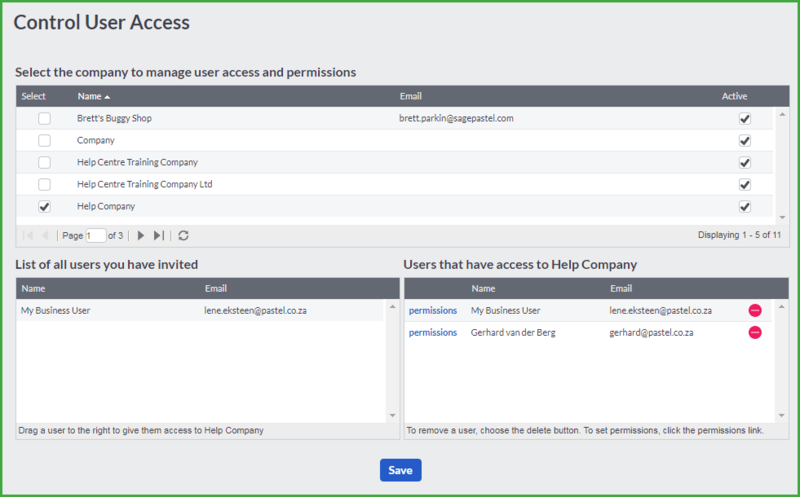 Select a company in the Select the company to manage user access and permissions section and the Users that have access to “company name” pane will display the users linked to the company. All of the users that have been added are displayed in the List of all users you have invited pane. To add an available user as a user in a company, you will drag the user name from the List of all users you have invited box to the Users that have access to “company name” box. There are some restrictions that are automatically placed on users in Accounting. As we have already said, if you have created a company, you will be the owner in that company. Security of your data is vital. You need to ensure that unauthorised people cannot access your data. You do this by setting a password that you must enter to open the company. You will create your password when you first log into Accounting. If you have received an invitation to Accounting, the system will generate a password for you that will be made up of a string of random characters. You may want to change your password at some stage. This is done in the Administration…Change Passwords screen. When changing your password, you will enter the current password and then enter and confirm your new password. If you forgot your password, you have the option to reset your password. On the Home screen, click on the reset password link. Enter your email address and click on the Reset Password button. You will then receive an email with a system generated password. As soon as you log in with the new system generated password, you will have to enter a new password. In this screen, you will manage your package subscription. 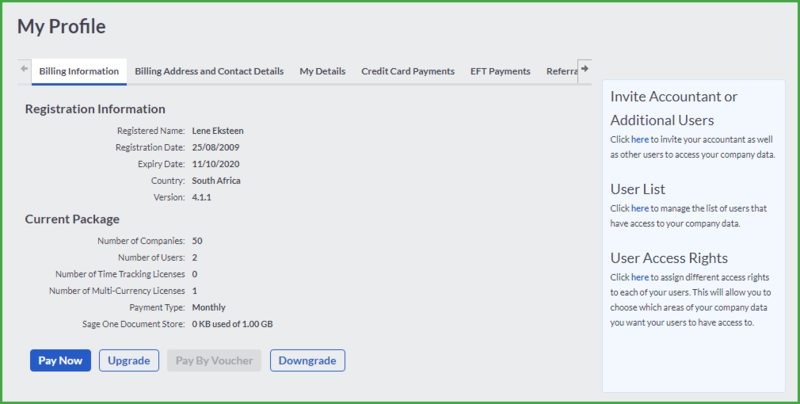 In order to set up your payment details, click on the Pay Now button. If you need to upgrade your account, click on the Upgrade My Account button. To leave Accounting, you can click on this option in the Administration menu or on the Logout icon in the toolbar. When you log out of Accounting, you will be back on the homepage where you signed in.